Here is our small, dynamic and dedicated team! 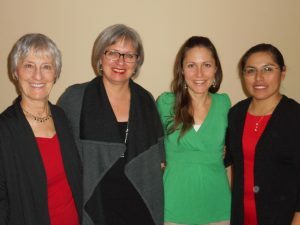 From left to right you find; Diane Gagnon, Diane Touchette, Maude Fodor and Nilda Esperanza Benito Mamani. Maude Fodor, founder of PachaMama Canada. Passionate about intercultural relations, Maude has been involved since 2004 with pursuit of international cooperation project conducted with CECI (Centre for International Studies and Cooperation) with the Aymara community of Peru. 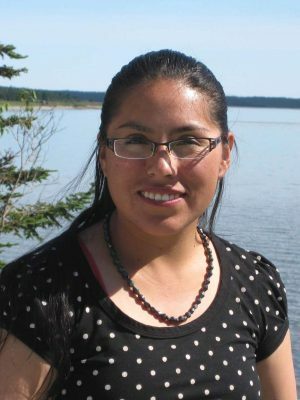 She has also participated in the international solidarity program Québec Sans Frontières (Ayacucho, Peru, 2005, CREDIL). She graduated in International Relations and International Law in 2005. Her leitmotif: human relations and preservation of customs and traditions. Here is Diane, an exceptional woman who devoted 50 years of her life to help and support people in need. Social worker by profession, she has worked with abused children, people with loss of autonomy and adults with severe trauma due to road or work accidents. Now retired, Diane worked at PachaMama Canada doing product management, quality control, preparation of orders and accounting. 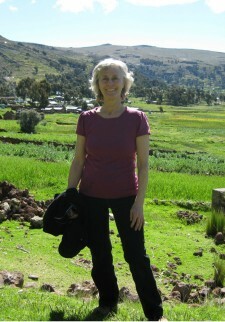 We would like to thank Diane because, even before being employed by PachaMama Canada, she volunteered for us. Her support since the very beginning of the project contributed greatly to the development of our small business. 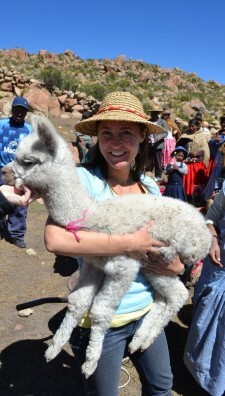 She was lucky to stay in Peru on two occasions and meet our artisan partners in the Puno region. Now retired, Diane worked at PachaMama Canada doing product management, quality control, preparation of orders and accounting. You find that she has a family resemblance to Maude? Yes, Diane is Maude’s mother! Nilda Esperanza Benito Mamani, assistant. * Acknowledgements: To the team of the Nature Centre of Mont St-Hilaire especially Isabelle and her family, Marie-Hélène and Leo, to Jacques and of course Maximus! Thank you Lima, Francis and Kristoff. Thank you all for your wonderful pictures! A special thank you to Ludyvine for his outstanding photography and graphic work! Heartfelt thanks to my mentor in business François Cormier. Thank you to Diane; PachaMama without you would not be a success! And of course thank you to our customers, fans and friends! – Maude Fodor.